To speak about Meister Eckhart is to speak about spiritual realization. Almost every single sermon of this master of Christian metaphysics and spirituality is ‘realizational’: each one of them issues an imperative summons to realize—to ‘make real’—the ‘one thing needful’. Now this ‘one thing’ is difficult to grasp, impossible to define, but the need for it enters into the very definition of human consciousness. How then to express it, and to express it in a way which heightens our sense of need for it, at the same time as pointing the way to the fulfilment of this need? Eckhart provides a particularly compelling model of how to express the inexpressible, and is certainly one of the most successful ‘preachers’ known to us, if our criterion of ‘success’ be this: rendering the imperative of spiritual realization not just intelligible but irresistible. One of the central aspects of this success lies in Eckhart’s use of images, analogies, metaphors, symbols—all of which, in different ways, do not so much express an ingenious use of language, as elicit the spiritual move required of all of us: just as the image is one step removed from that of which it is an image, so our consciousness is called to move from its outer surface to its own inner depth. Every image that is most ‘moving’, then, should be seen as a surging up, from within, of the reality expressed by the image; it is a living reality, within the inmost part of the soul, that calls out to be communicated, rather than just a mode of speech that reaches out for a goal as yet unconsummated. Hence for Eckhart, inner realization must come first, and then its verbal expression will effectively convey, if not the intrinsic reality of the experience itself, then at least that aspect of the realization which is communicable. It is useful to dwell on these striking words; to try to imagine the effect they would have upon Eckhart’s listeners. It is a simple image, and yet it is said to contain the essence of everything he ever preached about. We do not think he is exaggerating in making this bold claim. For in this image we discern, first and foremost, an intimation of the principle of union, for which Eckhart is of course renowned; but we also find an indication of the path to that union, that is intellective perception of the transcendent truth, a perception which implies self-effacement and methodic concentration; a concentration which is transformed, by grace, into realization of identity with the transcendent truth; a truth which is thereby revealed as one’s own deepest being. Transcendent truth is thus transfigured into immanent reality by the grace that is both elicited and constituted by intellective perception of, and pure concentration upon, the Absolute. This is the core of my interpretation of the image. Now I have to substantiate this interpretation, and the best way to do so is to refer, of course, to other parts of his teachings. The intellect can plumb the ‘eternal abysm’ out of which God, qua Creator, arose; in other words the intellect is intrinsically capable of discerning that there is, beyond God, a truly transcendent reality, a pure absolute that is not relativized by contact with any created realm. It is not enough to say that God is pure being, because being is itself a relativity, albeit the most indeterminate of all relativities. We have here a metaphysical version of the classical ontological proof of God: whereas for St. Anselm, the reality of God is proven by the human capacity for conceiving Him, for Eckhart, the relativity of God as Creator is proven by the intellectual capacity to conceive of the Essence which surpasses this relative dimension of the divine nature; and this intellectual capacity, in turn, proves or expresses the spiritual capacity for realizing identity with that Essence. The natural resources of the personal intellect are insufficient to grasp the source of the intellect, the ‘spark’ of the soul which transcends the soul itself even while mysteriously residing within it. This co-incidence of presence and transcendence can only be understood if the notion of depth comes to denote height: the spark in the depths of the soul is that transcendent source whence flow the powers of the intellect. That which flows cannot turn back and grasp the source of its own flow—therefore the natural functions of the intellect must be stilled as the condition for that miraculous re-flux or ‘inflowing’ back to the source; and this can only be a supernatural operation, an act of divine grace, the result of which is that the point of actual consciousness is transported into the immanent depth that the ground of the soul is. It is expedient for you that I should go away from you, for if I do not go away, the Holy Spirit cannot come to you. The dawn experiences a loss of identity as dawn, but this loss is infinitely compensated by the brilliance of the rising sun, before which no ‘dawn’ can subsist; the dim light of dawn must be annulled, but only by a light infinitely more radiant, and so it is with the soul: the limited light of its intellect must give way to the infinite light of the Absolute. This extract also helps to underline the methodic necessity of unitive concentration: the intellect, stripped bare of all contingent content, must concentrate on the exclusive reality of God so that, by virtue of its own uncreated substance, it may be sublimated within the uncreated light of God; one observes here a useful clarification of the point made earlier about the implication of the intellect’s capacity to conceive the supra-ontological essence: the eye of the intellect can only gaze on the light of God because of the affinity—and, in the final analysis, identity—between its own uncreated substance and the uncreated reality of God. This analogy is useful in elucidating the nature of pure, unitive concentration which may be envisaged as the methodic counterpart to this transcendent intellectual vision: what, a priori, is a focussing of attention on the supreme object that transcends the personal intellect, becomes, through methodic concentration, a realization of identity with that object, but not as object, rather as immanent subject, the very word ‘con-centration’ suggesting this process of assimilation within one’s own centre, a ‘taking from oneself into oneself’. To recapitulate: the intellect’s powers of conception function, in the first instance, in a negative manner, excluding all that which can form the basis for determinate—hence limited—conception; therefore, one may say that, in its purely conceptual mode, the intellect is only ‘satisfied’ by that which surpasses its own power of conception—the properly limitless, infinite, transcendent One. To say that the intellect ‘conceives’ of the Absolute—upon which it then concentrates—means that it can conceive of a ‘somewhat’ which is intelligible only by way of negation: as was stated earlier, one can conceive of something which transcends the limits imposed by determinate conception as such; thus it is a conception of the intrinsically inconceivable. But this something that is intrinsically inconceivable is nonetheless still a conception since it is present to the mind in some way. In other words, it is possible to conceive that it is, but impossible to conceive what it is. These points might be made clearer by means of Eckhart’s notion of what it means to speak the Word. The Father eternally ‘speaks’ the Word which is the Son. What this means is that ‘The object of the Father’s thought is the eternal Word’. (II:300) The Son as Word is therefore the determinate object of the intellection of the Father. For the intellect to unite with the formless essence can then be seen as the inverse of this process. While the first is a downward movement intending manifestation, determination and hence limitation, the second is an upward movement intending the non-manifest, indeterminate and limitless. The act of pure transcendence by which the uncreated intellect realizes the essence—the act of vision that unites the eye to the wood—is thus only conceivable as the counterpart of the divine breakthrough into the soul’s essence, so that it would be more accurate to say that it is the Absolute as transcendent object that breaks through and assimilates to itself the uncreated element residing within the depths of the relative subject, rather than to assert baldly that the uncreated intellect ‘attains’ or breaks through into the essence. In other words, the wood absorbs the eye into itself; the eye does not assimilate the wood to itself. The food digests the one who eats it, and not the other way around. The drop becomes the ocean; the ocean does not become the drop. As quoted earlier, he said also ‘We cannot serve this Word better than in stillness and silence’; this clearly implies what we have called a spiritual method. Likewise, in another sermon, he puts to himself the question: is it always necessary to be so ‘barren and estranged from everything, outward and inward’—can one not pray, listen to sermons, and so on, to help oneself? He answers: ‘No, be sure of this. Absolute stillness for as long as possible is best of all for you. You cannot exchange this state for any other without harm.’ (I:43) Let me repeat: ‘Absolute stillness for as long as possible’: this sounds very much like a method, the passive or negative aspect of that positive concentration by the inmost intellect on the pure Absolute. Therefore, the true or transcendent meaning of humanity is Divinity, which amounts to saying that man is only true to his deepest nature to the extent that he transcends himself, which he does, in the first instance, by purifying himself from ‘all of that which the eternal Word did not assume’. It is clear that Eckhart is here stressing the necessity of the divinization of the human and not the humanization of the Divine: the lower must extinguish itself in the face of the higher and only then be re-absorbed by it, rather than bring down the higher to its own level and assimilate it crudely to one’s personal actuality. The essence of the soul is darkened and enshrouded by the body: the alchemical ‘reduction’ or ‘dissolution’ required is evidently not aimed at the body qua material, but rather at the soul insofar as it has taken on itself the darkness of its covering: the psychic traces of matter and corporeality, passion for the perishable, attachment to the transient material that is ‘created after nothing’ (I:203). The more the natural, fallen and actual state of the soul—the unrefined copper—is taken for the essence of its being and consciousness, the more false it becomes, the more susceptible to pride, which here means deifying the creature as such, taking darkness for light. One should recall here the idea of copper being more exalted in gold than it is in itself: earlier this image was used in regard to the distinction between Being and Beyond-Being, but it applies with equal relevance to the soul and God: the soul realizes a plenitude in God that is strictly excluded on the plane of its separative affirmation as soul. If this reduction to pure humanity constitutes the aim and limit of the human being’s capacity and renders him at one with the Word, the question now arises: what is it that the Son ‘knows’ of the Father, and that now the individual, reduced to ‘bare humanity’ and thus the Word, also knows, and is? In what does this knowledge and being consist? Now these ‘contents’ of the supreme reality of union can not of course be conveyed by the simple image of the eye and the wood. The image can point to the reality of union, but that which flows forth from union can only be experienced, and cannot be conveyed by any image. Even these words used by Eckhart to describe the Word are to be understood in a provisional sense: there are not three distinct elements, each being somehow akin to our empirical awareness of power, knowledge and joy. Rather, they refer to one undifferentiated reality, each element being absolutely identical with the other two, in a mode which utterly transcends all creaturely understanding of power, wisdom or sweetness. These three elements, on the human plane, are images of the archetypes, shadows of realities, conveying something of the character of those realities, but unable to capture their absoluteness. For that absoluteness to be realized, all relativity is to be eliminated; the ‘wood’ of the soul qua soul is to be burnt up in the fire of the Absolute; the drop is to return to the ocean; the dawn is annihilated in the rising sun. But then, one might ask, to what does consciousness return once this union is consummated? For it is a union that strictly requires that one agent of the union must ‘lose its being’, as we heard earlier. Some concluding words: Eckhart’s whole teaching points to the need to go from the image to That of which it is an image, from the shadow to That which casts the shadow. One must use the image as an icon, and not as an idol. Eckhart uses images—marvellously and convincingly—to demonstrate how we must finally leave behind all images. But to sacrifice is to sacralize: everything which one sacrifices for the sake of the silence required by the Word is regained in absolute plenitude in the source of the Word: virginal receptivity is transformed into infinite fecundity. He who has abandoned all his will savours my teaching and hears my words. 1 This is the text of a lecture given at the Eckhart Society Annual Conference, Plater College, Oxford, August 23. It summarizes the most important points made in the chapter on Eckhart in the forthcoming publication, Paths to Transcendence: Shankara, Ibn Arabi and Meister Eckhart on Transcendent Spiritual Realization by Reza Shah-Kazemi (State University of New York). 2 All sermon references are to Meister Eckhart—Sermons and Treatises, (vols I-III) Translated and Edited by M. O’C. Walshe (Longmead: Element Books, 1987,1989). 3 This evokes for us the Islamic etymology of kufr, disbelief: the primary meaning of the word refers to the idea of ‘covering over’. The kafir is not just the disbeliever but also the farmer who ‘covers’ the seed with earth. Faith and, at a deeper level, gnosis, can be likened to treasure, buried within the earth of forgetfulness. 4 The Sufis describe themselves as being in the world but not of it. 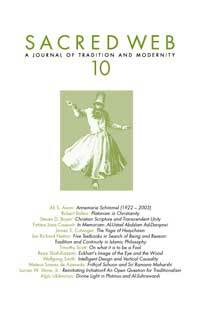 6 The Thousand Teachings (Upadesa Sahasri) (London: Shanti Sadan, 1990) Tr. A.J. Alston, II, 18.108. 7 This characterisation of the Word also recalls one of Ibn Arabi’s descriptions of Being (wujud): it is the finding of the Real in ecstasy (wujud wijdan al-haqq fi’l-wajd). See W.C. Chittick, The Sufi Path of Knowledge (Albany: State University of New York, 1989), p.212. We have commented on this remarkable parallel between the three mystics in the forthcoming work cited above.